Before plodding ahead, let’s get our terms straight. The American College of Surgeons defines operations as concurrent “when the critical or key components of the procedures for which the primary attending surgeon is responsible are occurring all or in part at the same time” and as overlapping “when the key or critical elements of the first operation have been completed, and … a second operation is started in another operating room while a qualified practitioner performs noncritical components of the first operation. With concurrent surgery, the “hard part” of the two surgeries are done at the same time. With overlapping surgery, the “hard part” of the two surgeries are NOT done at the same time. And, even with overlapping surgeries, distinctions are made as to how much overlap is actually occurring. 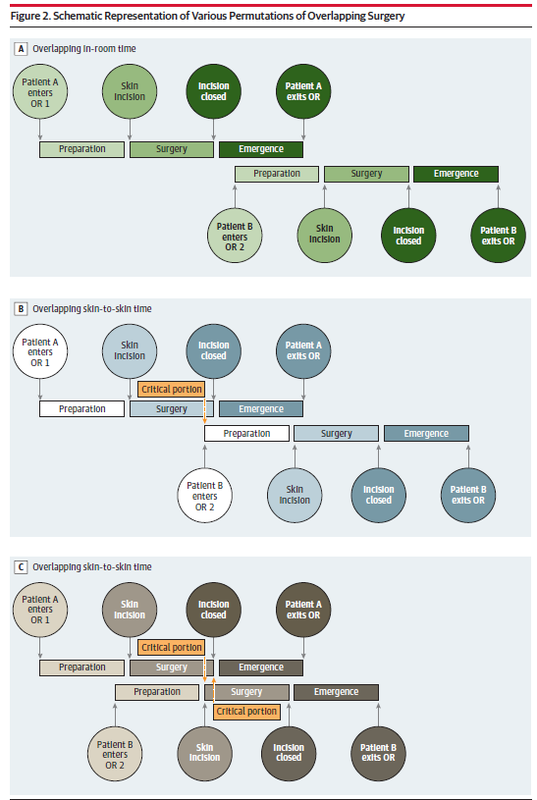 The American College of Surgeons states that concurrent surgeries are not appropriate (and this parallels Medicare billing rules); while overlapping surgeries are, as long as the patient is informed. A recent paper looked at retrospective data to see whether overlapping neurosurgical procedures put any patients at increased risk. Data from matched overlapping to non-overlapping procedures were analyzed. The primary differences between the two groups were narrow. The overlapping surgery patients had longer in-room times and longer skin-to-skin times; possibly because the team was waiting for the surgeon to show up and do the critical work. Regardless, there was no association between mortality, morbidity, or worsened functional status. In aggregate, overlapping procedures did not put the patient in harm’s way. The primary argument in favor of overlapping surgeries is that is has the potential to benefit patients by maximizing efficiency and making highly sought-after specialists available to greater number of patients. And recent data suggests this benefit is not at the expense of increased patient risk. Send us a brief description of what you believe qualifies for the most frivolous lawsuit. Email us at infonews@medicaljustice-staging.shfpvdx8-liquidwebsites.com. You have to have personal knowledge of the case. Either you were a named defendant. Or you knew the named defendant. Supposedly there isn’t increased risk with overlapping surgeries. Apparently data has not shown increased risk. However, I think we all know full well that even the non critical portion of a surgery is quite likely to be performed better by th the primary surgeon than by others such as house staff, surgical assistants or techs, etc. In other words, maybe the risk is not demonstrably higher (although I am certain it is at least a little bit higher), but the quality of the wound closure, or the dissection, or the approach to name a few examples, is not as good as when carried out by the main surgeon most of the time. To suggest otherwise is a bit self-serving and not entirely honest. The primary reason for these overlapping surgeries is to make more money for the surgeon and or the facility. It is not demonstrably safer for the patient. There is the risk of extended anesthesia time for the following surgery if there is a complication delaying the ending of the preceding procedure.